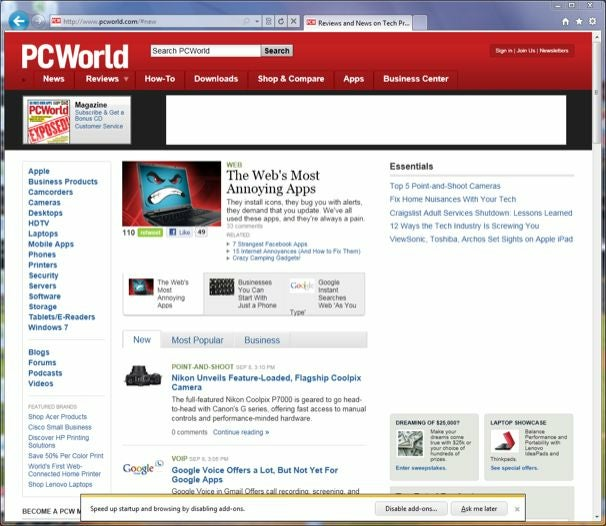 Since the release of IE9 beta on Sept. 15, we've been playing with the 32-bit Windows Vista and 64-bit Windows 7 versions -- doing nothing technically fancy with them, like benchmarking, but just using them in our everyday Web surfing routine. 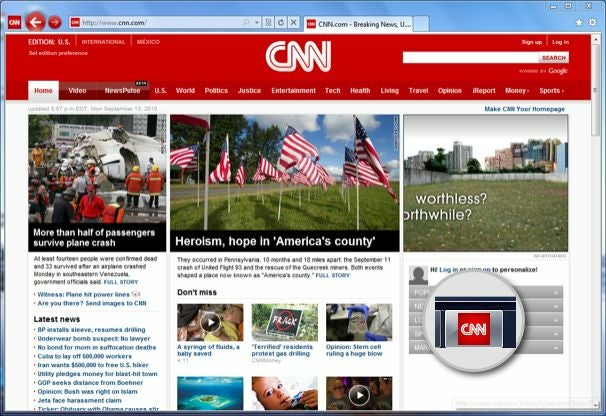 Here are six things about the latest Microsoft Web browser we really like. And six which we think could use some more work before IE9 sees a final release. We tried the famous fish tank demo on the 32-bit version of IE9 and on the latest 32-bit Google Chrome beta. On a low-end notebook (a 6-year-old Dell running Vista), Chrome could only render 20 fish at a pitiful 1 frame per second. Barely. IE9? Around 15 to 20 frames per second. Besides better coding, IE9 incorporates GPU acceleration -- which basically means the browser passes on the heavy-duty processing of such Web animations to your computer's graphics chipset. IE9 features a new font set that makes small text easier to read. We found this very obvious when comparing Gmail on IE9 vs. the latest Chrome beta. Not only was the font clearly darker and more legible on IE9, it was subtly narrower, enabling more text to occupy each line. The font also scaled up, enlarging, quite well. The URL address box pulls double duty as an Internet search box. Type in a word or phrase, and you'll be presented with icons representing the search engines you have selected to be used directly within IE9. Click on a search engine's icon, hit "Enter," and search results from that service will be shown inside the browser window. We found this way in which IE9 handles multiple search engines quick and convenient. A feature popularized by Chrome, IE9 lets you tear out tabs: you click on a tab, drag it outside the main browser window, let go, and the tab sprouts into a separate running instance of the Web browser. The opposite of this function also works like the way it does in Chrome. Click and drag a tab, or an entire IE9 browser window, over to another running instance of the browser, and they will merge into one browser, combining their tabs. This tab tearing and merging works flawlessly in IE9 beta. If your installation of IE9 appears to be bogged down with too many or malicious add-ons, the browser will alert you of this upon start up. It will list the add-ons that have been installed, and let you choose which ones you want to shut down or allow to continue running. We found this security feature surprisingly helpful as a means to audit and prune unnecessary add-ons. You can also imagine the obvious benefit this has for alerting you of any spyware, useless toolbars, or other rogue add-ons you don't remember installing on IE9. On Windows 7, you can pin links onto the operating system's taskbar, turning them into icons that open the page when clicked. Essentially, this function -- similar to one found in Chrome -- turns a site into a "virtual application."